Because we are engaged in spiritual warfare, consider adapting the military’s method of rating the combat readiness of its units. This rating system considers the effectiveness of training, the availability of proper equipment for the unit’s mission, awareness of the enemy’s capabilities, demonstrated ability to apply the strategy and tactics for defeating the enemy, and the health and morale of the personnel. 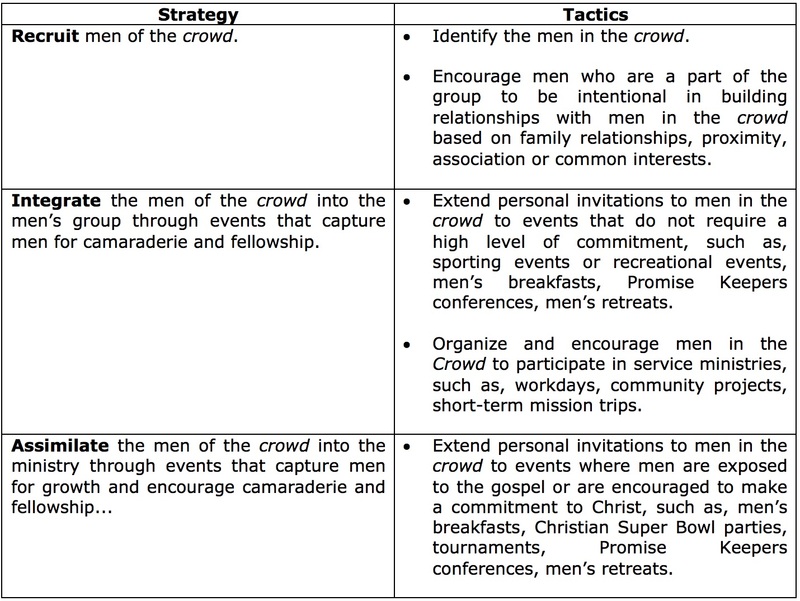 Overarching Strategy: Know your men. In order for a man to change, he needs to be engaged; engaged with other men, engaged in the Word, and engaged in service. There must be intentionality, first on the part of disciplers and then on the part of the man. Spiritual growth does not just happen. 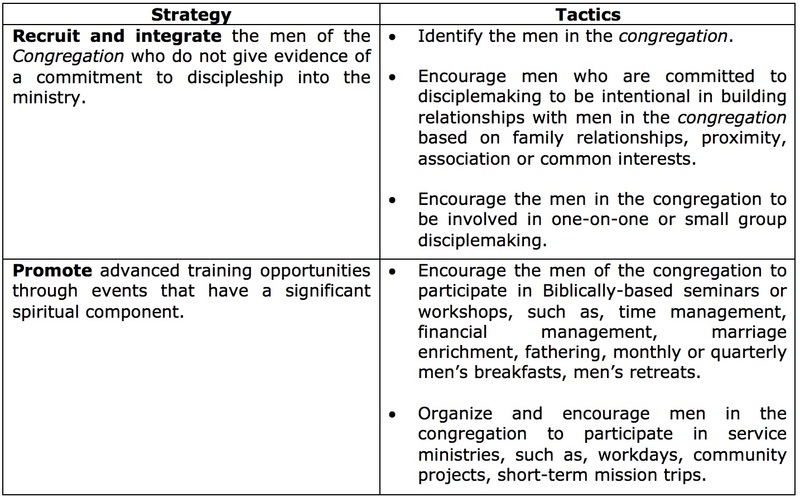 Consider enlisting a man to oversee and encourage the men in each level of commitment. Condition: These are men who reside in the geographical area of your church. This may include husbands, brothers, dads, sons, or friends who are considered to be within the ministry scope of the church or within the sphere of influence of individuals in the church but have little or no connection to the church. They may be pre-Christian or nominal believers. Condition: These are men who have some connection or affinity with your church. The only thing these men have in common is they are somewhat committed to attend a worship service. These men may be non-believers, or at best, nominal believers. As nominal believers, they may carry baggage from their lives prior to salvation, that is, they may be wandering in the desert like the children of Israel. Condition: These are men who regularly gather on a Sunday morning in the local church. They most likely have made a commitment to Christ, worship and to the purpose of fellowship. These men may not have experienced the freedom that comes with making Jesus the Lord of their lives. Condition: These are men who have made a commitment to Christ, worship, fellowship and discipleship but are not deeply involved in ministry. They are in the process of unloading the baggage from their previous life and growing in a deeper relationship with and trust in the Lord. Condition: These are the men who have the deepest level of commitment. 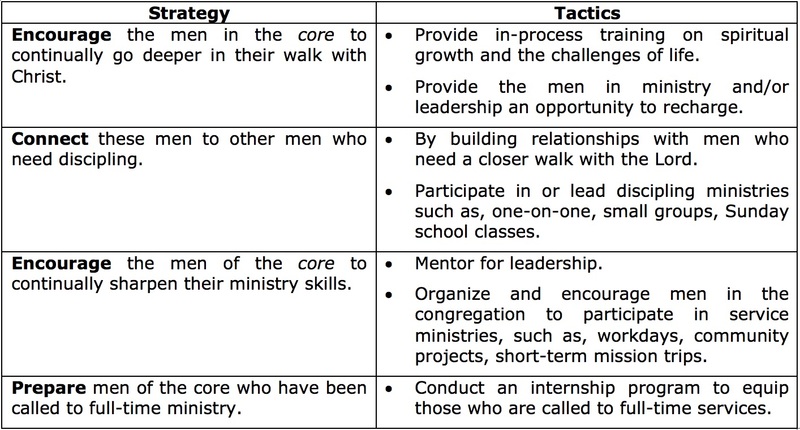 They lead ministries or are actively engaged in serving the church. These men may be encountering spiritual battles in their ministry, family, or personal lives.